We, participants of the Prague Conference "European Conscience and Communism", address all peoples of Europe, all European political institutions including national governments, parliaments, European Parliament, European Commission, Council of Europe and other relevant international bodies, and call on them to embrace the ideas and appeals stipulated in this Prague Declaration and to implement them in practical steps and policies. Facing a terror wave from the communists, the journalists headed for the OSCE building for support and protection. A wrong move, as journalists from Antena 3 tv station would learn, to their bitter surprise. The team consisting of Petru Terguta, Dan Nitescu and Victor Ciprian has been harrassed, watched and threatened until Thursday, the 9th of April. Policemen in civil clothes searched for them at the hotel, and on their phones they kept receiving threatening messages. Antena 3 decided to withdraw them back home and sent them to the OSCE building to ask for protection. Terguta, Moldovan citizen, had been warned that he would be arrested and could not be protected by the Romanian consulate. Aura Titiriga, senior editor at Antena 3, tells how the journalists entered the OSCE building, and then the head of the mission, Philip Remler, agressed them verbally, being more and more violent in persuading them to leave the mission’s headquarters. Remler threatened he would call the police, which was looking for the journalists anyway. Eventually, an OSCE representative accompanied the journalists in town and all the way to the border. The next day, Terguta’s brother, Ion Terguta, was arrested on the street together with TVR tv station correspondent, Doru Dendiu. On Saturday, after days of more and more obvious abuses on journalists, the Deutsche Welle correspondent, Vitalie Calugareanu, tried to contact the OSCE mission to ask them how they were complying with their mandate of monitoring the freedom of the press. The OSCE mission was empty, only one person was taking calls, and that person was speaking Russian only and said all others were left on Easter holiday. Oficially, the version told by the OSCE is that the mission in Moldova only monitors and reports the abuses cases on journalists and gives them further to the Government from Chisinau. They say they cannot offer consular protection or political asylum. Basically, Moldovan journalists, beaten or arrested on the streets by the police, must go through a whole bureaucratic international system, so that finally the reclaimed abuse would be examined by the same policemen that beat them. This international entity is as useless, as it is costing. The OSCE mandate has four coordinates, one of them being mass-media and human rights. 48 employees, with a yearly budget of two million euros, of which 300 000 only for the mass-media, all these so that OSCE can go on holiday during the most serious abuses during the last 20 years. The only public statements that the OSCE office made were on the 6th and th of April. On the 6th they hurried to say that the elections had been ok. On the 7th they condemned the violences in Chisinau. No word after that, during the next days when the Moldovan journalists feared to get out of their houses and expected being arrested any moment. Only on the 14th the OSCE “woke up” from their Easter holiday. A press release from the OSCE representative, Miklos Haraszti, condemned the abuses of the authorities from Chisinau. A weird thing: although the OSCE statement was supposed to refer strictly to the serious abuses of the police and special services, Haraszti wanted to preach conduct and ethics lessons to the journalists. Filled with deep Christian feelings inside, after an Easter weekend, Haraszti urged them to keep their mouths shut and not “inflame the situation” or “personally get involved in the events they speak about“. Better said, they were supposed to leave their arrested and beaten bodies and write news from up above, from heaven. The organisation was founded during the 70’s. One of the defining lines was protecting democratic values and human rights. After 30 years, in September 2008, the Russian ambassador in Wien formally asked OSCE to give up this priority, and focus on economical and security problems. Privately, it was requested the neutralization of the Office for Democratic Institutions and Human Rights (ODIHR), the agency which is in charge of monitoring the elections and which has an unacceptable “insolence” (to be read: “independence”) degree. Russia is one of the main sponsors (approximately 35% of the OSCE budget) and does not understand to be criticized on its own money. The revolt of the political elite of soviet origins toughened after the Chechen crisis, when OSCE released one of its most severe and most criticizing towards Russian government reports. Basically, and especially since 2004, the monitoring elections reports started being politically censored by the diplomats of the organisation. Accounts like “The police surrounded the headquarters of the main opposition party” (Russia, 2003) disappeared from the final OSCE / ODIHR reports; generally, frustration dominates the observers who have been breaking their bones during the monitoring campaigns: the information for which lives are risked are supressed, up to disappearance, by the diplomatic negociation of the political representatives with the local authorities, inside the OSCE. Currently, Georgia does not event want to hear of the OSCE anymore, as they consider it an organisation which represents the interests of the Kremlin. In Russia, the assistance mission was closed, and since 2007, monitoring elections in that country was given up altogether. In Moldova, the report on the elections was made public on Monday, after just a few hours since the end of the elections. European observers’ remarks were ruled out: baroness Emma Nicholson showed the access blocking of the Moldovan citizens to the voting sections, across the Nistru river. Marian Jean Marinescu showed that 200 000 more people appeared on the voting lists, as compared to the previous elections, and many other problems that were not just “mere incidents“, but affected profoundly the elections process. Such problems that were removed from the report made tens of thousands of Moldovan get out on streets. This way, the OSCE hostility towards journalists is nothing but a symptom of a much more serious illness of this organisation. If the Russian government manages to control through blackmail the activity of a multinational institution, meant to protect human rights in Europe, the purpose of this organisation is compromised. And if we add the fact that the access of the Romanians in the structure of the OSCE mission is basically forbidden, while the Russian becomes a compulsory language to get to top levels inside OSCE, one wonders if there is any use in sponsoring an organisation which appears to have become a tourism agency for the post-soviet maffia. Hungarian Kalman Mizsei is the special EU representative in Moldova. Two years ago, he warned Romania to give up their “older brother” attitude towards Moldova. Miszei exceeded his attributions by ordering Romania to sign the base treaty with Moldova and by asking that Romania should give up granting Romanian citizenship to Moldovans, which is a sovereign atribute of Romania. The EU representative ended his speech by praising the “pluralism” and the “civil society” in Transnistria. Kalman Miszei ended up becoming a EU representative in Moldova after he had to quit from the United Nations’ Program for Development, following some serious accusations of corruption regarding financing the rehabilitation of the Moscow Planetarium with European money. Inner Citty Press, a non-profit organisation, which watches the spending of the granted funds for poor communities by UN, the World Bank, PNUD a.s.o, brings serious accusations to Miszei. The presenter of the elections report was the Estonian Marianne Mikko, who represented the European Parliament at the elections in the Republic of Moldova. Mikko should not have been an observer there, as being biased, as a co-president of the EU-Moldova Committee together with the communist Stepaniuc, and by her numerous statements during time, which proved her anti-Romanian subjectivity. Mikko, an ex-journalist for a communist newspaper during the USSR, attacked heavily the Romanian president for his intention of granting Romanian citizenship to the Moldovans, which is a sovereign right of Romania. By breaching any protocol, Mikko accused him of “lack of wisdom“, then withdrawing her statement and saying that the press misinterpreted her. The Estonian representative opposes Romania taking part in the negociation format with Transnistria and Moldova joinig the EU at the same time with the West Balkan countries. Mikko stirred a whole scandal in Europe by her initiative of restricting the bloggers’ freedom of expression and the obligativity of identifying them. The most active influence Russian agent in the observers delegation at the elections in the Republic of Moldova is the British David Wilshire, a representative of the Council of Europe. Wilshire is a notorious propangandist of Moscow interests. Last year he scandalized the public opinion in the UK, when he accused Georgia of agression against Russia, following him taking part in a delegation in the ex-soviet area. The British newspaper “The Guardian“, after reviewing all Wilshire’s pro-Russian antecedents, uncovers his slatternly lobby to impose Mihail Margelov, Putin’s man, as president of the Parliamentary Assembly of the Council of Europe (APCE), in January 2008. After the Spanish socialist Luis Maria de Puig became president of the APCE, in the detriment of Margelov, Wilshire refused to shake hands with de Puig, saying that he had “prepared his congratulations speech in Russian, not in Spanish“. The Moscow newspaper “Kommersant” considered the event as tragic, because de Puig has just been elected, when he invited Mihail Saakasvili, the Georgian president, to the APCE session, and the APCE delegates criticized the elections for the Parliament in Russia. David Wilshire reacted, saying that the Russian elections had been correct, while the Georgian ones had been frauded. Dear Mr President / SOS Moldova! Sign in the petition and speak up your voice. This petition targets the European Union, the European Commission and the Council of Europe to intervene and send missions to Moldova. For your information, the petition is hosted here. Is Election Crisis in Moldova Part of a Pattern in Post-Soviet Republics? Moldova’s Constitutional Court has upheld the results of a vote recount that confirmed the victory of the ruling Communist Party in the nation’s April 5th parliamentary elections. The recount was initiated by the Communist Party of President Vladimir Voronin. Leaders of the three main opposition parties called the recount a sham and had asked the court to overturn the election results. The recount confirmed the Communist Party won 60 seats in Parliament – one less than needed to nominate a president, but sufficient to form the government. The opposition refused to participate in the recount of the vote, insisting instead on checking the electoral lists, according to Moldovan political analyst Vlad Lupan, who has a radio show in the capital city, Chisinau. Speaking on VOA’s International Press Club, Lupan told program host Judith Latham, “The electoral lists contained names of people who had died as well as those who voted multiple times.” “The police arrested even those demonstrators who had protested non-violently and some of them were tortured,” he said. Lupan said the youth are now afraid and that he thinks it unlikely they will demonstrate again. The majority of Moldova’s 3.8 million people are ethnic Romanian, but there are also sizable minorities of Russian and Ukrainian speakers – as well as the Gagauz, a Turkic group that is Orthodox Christian. “About 10 percent of the country identifies itself with Russia,” he said. He compares the political situation in Moldova with that in Georgia’s breakaway regions of South Ossetia and Abkhazia, where Moscow issued passports to locals as a pretext for an invasion aimed at “protecting” its own citizens. “The dispute over Moldova’s integration with Europe has far more to do with Russia’s claim of a sphere of influence in the former Soviet republics than with concern for Moldova’s Russian minority,” said Lupan. “The problem extends," he says, “to Ukraine and the disputed region of Trans-Dniester.” [Also called Transniestria by ethnic Romanians, Trans-Dniester includes that area between the left bank of the river Dniester and the border with Ukraine.] 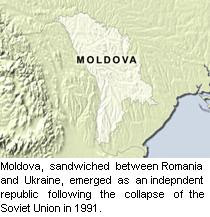 Trans-Dniester was part of the Moldavian Soviet Socialist Republic before the collapse of the Soviet Union, but declared its independence from the rest of Moldova in 1990. De jure part of the modern Republic of Moldova, Trans-Dniester is a de facto independent state whose political status remains unresolved. Vlad Lupan describes the government of Moldova today as “authoritarian,” not unlike Russia but “not yet on the level of the dictatorship in Belarus.” “Moldova currently faces critical issues of a geo-strategic and economic nature,” he said. Lupan considers it inevitable that the interests of Russia and the European Union will collide in Moldova, Ukraine, and the former Soviet republics in the Caucasus. “Stability in the Black Sea region, a major transit route for oil, is critical to both the European Union and the United States,” he adds. Nelson, a widely respected academic and foreign policy consultant, reminds us that Moldova’s current situation is tied to its post-World War II history. “Moldova was historically part of Romania,” he said, “but because of Romania’s involvement in World War II on the side of Germany, the Soviet Union took Moldova and absorbed it as a Soviet Socialist Republic.” That separation remains today – both physically and politically. Earlier this month, following the parliamentary elections, President Voronin accused Romania of masterminding anti-communist disturbances and with trying to overthrow his government. In retaliation, he expelled Romania's ambassador and introduced the idea of Moldovan visas for Romanians. Moscow backed his allegation of foreign interference, but Romania, a NATO and EU member, rejected Mr. Voronin's words as a "provocation." 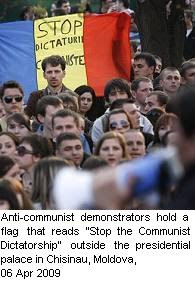 “Neither the European Union nor NATO is making any claim on the territory of Moldova,” Daniel Nelson said. Looking to the future, Nelson said “the best possible outcome – notwithstanding the April 5th elections – would be a stable Moldova that has some elements of prosperity.” Moldova is the poorest country in Europe.